In Part-One of this two-part series, we looked at how the once unified Kingdom of Israel was split into two kingdoms, Israel and Judah. We also explored the lives and physical proof in the seals/bulla of two kings of Judah, Ahaz and Hezekiah. In this part we will examine the lives of two more kings—King Zedekiah of Judah, and King Jeroboam II of Israel. We will take a look at the physical evidence discovered that speak of these two kings in the form of their seals/bulla. Finally, we will briefly conclude with a look at the importance and power of these kingly seals, and what we as believers can take away from this living history. In the biblical record, we see that there were 19 kings of Israel over her 209 years, and 20 kings of Judah over her 345 years—39 kings combined who reigned in the divided kingdom. When we add in the three kings of the unified kingdom, prior to these, we have a recorded total of 42 kings in all. Yet, today, proof of their existence is no longer confined to the Word, but instead, expanded to the discovered relics from jars, to great carved stones, and even to seals, or clay bulla—bringing that history to life! While some of the kings of Judah followed after God and listened to the word of the prophet, many did not. King Zedekiah, the last king of Judah before all of Judah was taken into captivity by the Babylonians in 586, did evil in the sight of the Lord all his days. He failed to listen to the words of the prophets, Habakkuk, Zephaniah, Jeremiah, and Ezekiel. In fact, Zedekiah, while wanting to listen rather than obey, even had Jeremiah imprisoned so that he would be the only one to hear the word of the prophet, making it impossible for Jeremiah to tell anyone else! Yet, despite Zedekiah’s evil, his name is not only in the written Word, but has survived through the discoveries in the archaeological record. Two clay bulla bearing the seals of two of King Zedekiah’s royal ministers were found, bringing proof to the recorded Word—one of Jucal, son of Shelemiah, and the other Gedaliah, son of Pashur. 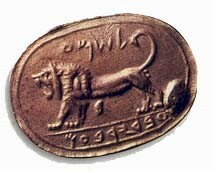 While King Zedekiah’s name is not upon the bulla, they do bear proof of his existence. First, because they were found in what may have been King David’s Palace in Jerusalem, where the kings of Judah resided. Secondly, they are of the appropriate style and age to support the biblical texts. And lastly, the names upon these two bulla correspond exactly with two of Zedekiah’s ministers who took Jeremiah into captivity, found in the book of Jeremiah. Still, beyond Jerusalem, in the kingdom of Israel, there were many kings—though none who truly followed after God, and Jeroboam II was no exception. Living during the time of the prophets Amos, Hosea, and Jonah, and only 31 years before Israel would be taken into captivity by the Assyrians, Jeroboam II did evil in the sight of the Lord all his days. In 1904 the seal of a royal minister of Jeroboam II, Shema, was found—a rarity not only because it gives us insight into a king, but because it was a jasper seal used to create the impression on clay bulla. While the seal was found over one-hundred years ago, and lost years after its discovery, today there are still many original replicas of the seal, as well as photographic evidence and documentation of the find, to prove the validity of not only the seal, but of Jeroboam II’s existence. As we have discovered, a simple clay bulla made by a seal can, so to speak, seal the validity of the Word. These bulla were made to be fragile and never meant to see the heat of a kiln, yet, with the various multiple ransacking of the Promised Land—particularly Jerusalem—the land itself became a kiln, sealing in the history of the land through fire! When a document was written, particularly a document from a king or those of standing, it was often sealed using a small piece of clay—often multiple pieces over the length of the document—sitting over a string. If a document was opened the seal physically had to be broken because it was so fragile! There was no way around the breaking of at least one of the seals, and the person who was intended to receive the document would therefore know if it had been tampered with or read before they received it. Yet, a seal and clay did more than protect documents from prying eyes… it was a symbol of honor and power. If you put your seal to the clay, or gave someone your seal to do it for you, it was binding. What was written inside was approved by the seal pressing down upon the clay; it was a sanction of validity, be it upon a new law, or a simple agreement for payment of goods. If someone were given the seal of say, a king, they could, potentially, pass laws, charge for goods, etc., and this gave power… even if the power may only be temporary, or worse, if misused, incur wrath! An honorable person’s seal would hold more power than a dishonorable one. And, of course, a king’s seal—be they good or evil—would hold more power still… even the power of life and death! As we discovered, the archaeological proof of the Word has grown in leaps and bounds over the years! Our faith can be, through the seeing and knowing of the Word, strengthened by these finds. And yet, because so much of the Bible revolves around Israel and the children of Abraham, this physical evidence becomes even more important! It reminds us, fellow believers, of the Jewish roots of our faith—of our brothers and sisters—while, also reminding the world that the Jewish people have a long, and strong, connection to the land! Today, the very validity of Israel’s right to the land is questioned, while all around her she faces conflict and terror. Yet, the proof of her existence and heritage is there in the soil, showing us that her history—and ours—is there! Because of this, we must remember what the Word says in Romans 1 and 2… that both blessing and cursing come to the Jew first. So, as we bless Israel by planting life within her, we will, in turn, be blessed!